And Tokyo is the perfect place to sport it! When in the bustling Japanese capital of Tokyo, do as the locals do! 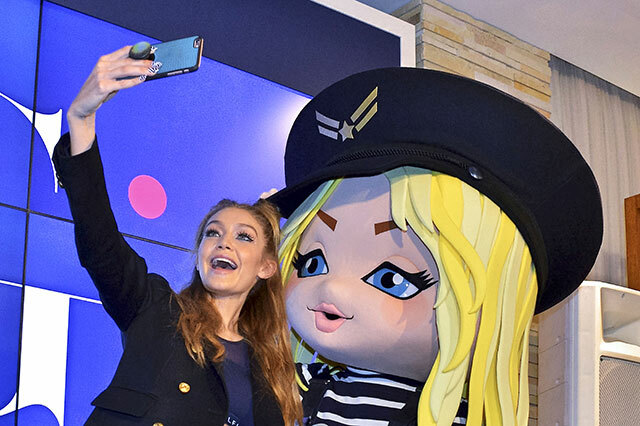 Gigi Hadid certainly wasted no time leveling up on the kawaii front, after flying to the land of Pokemon, pachinko, and purikura to launch her fashion line for Tommy Hilfiger. On October 12, the model dropped by the brand’s boutique at the posh Omotesando district to promote the new Tommy x Gigi collection. Gigi took the stage in a sports bra and boxing shorts, pulled together with an oversized blazer, thigh-high socks, and ankle boots. But it’s the beauty department where Gigi really stepped it up! We’re so used to seeing her in glamorous curls and smoky eyes, or low-key buns and barely any makeup, that it’s really refreshing to see her dolled up in playful pop culture-inspired looks. For her Tokyo visit, that meant long tresses topped off with double buns, feline-like eyes emphasized with rhinestone studs and colored liner, and nails jazzed up with geometric art. Further proof that this woman can pull off just about anything. Love!